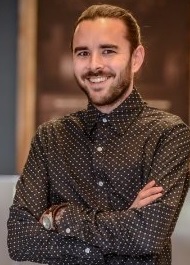 THIS SUMMER, Joshua 'Josh' Cournoyer tightened his focus as campus director for the Nashville market for The Iron Yard (TIY), the technology-education company based in Greenville, S.C.
Cournoyer, 31, planted his coffee cup in the Nashville Entrepreneur Center a year or so ago, where, he told Venture Nashville, he was quickly introduced to a robust group of Tech-centric individuals by EC President Sam Lingo and then-Nashville Technology Council CEO Bryan Huddleston. Though initially he was also helping TIY scout and launch in several other Mid-Western cities, he's now focused entirely on the Mid-Tennessee marketplace, operating from downtown offices in The Ink Building on Ewing Street. Seventy techies in nine cohorts have already come through TIY training in Nashville, Cournoyer said today. TIY staff here are now four, including two instructors supporting instruction in back- and front-end engineering and user interface (UI) design. TIY is majority-owned by Apollo Education Group (NASDAQ: APOL), which acquired its controlling stake in 4Q 2015, in a transaction valued at about $15MM, according to SEC filings. TIY's previous investors included South Carolina-based Capital A Partners (Charleston) and Upstate Carolina Angel Network (UCAN, Greenville). Prior to TIY, Cournoyer's experience was in operations and promotion for a publishing company and for music and entertainment venues.